This World Honey Bee Day - we’re giving away a mega prize. And we’re buzzing to tell you about it! While not as notable as Christmas, Valentine’s or Mother’s Day, we take World Honey Bee Day very seriously. So seriously that we’re giving away perhaps the best prize, we’ve ever offered! We have teamed up with Abeego, the reusable beeswax food wrap company, to create a gift basket fit for a queen (bee). Before we tell you exactly what’s inside, here’s why we’re running this sweet, sweet contest! We love that back in 2009 a group of beekeepers successfully launched the official World Honey Bee Day. The fact that a whole day is dedicated to our little friends, helps build awareness around just how important they are to this planet. Everyday, all of the hard work bees put into collecting nectar and pollinating plants not only results in delicious honey, but also makes sure crops grow to be as healthy as can be. If one day bees were wiped off the face of the earth, we’d be in a pretty sticky situation! Thankfully, honey bees are around to give us the gift of food. To celebrate that, we want to gift one of you, a special bee-themed treat basket. On top of all of that, Abeego have added a box of their variety set of breathable beeswax food wrap that you can use to keep all of your food fresh. Their ingenious food wrap eliminates the need for plastic wrap, or boxes and instead provides a sustainable, reusable way to keep an array of foods fresher for longer. And again, this great product is all thanks to those clever bees and the versatile beeswax they create. To round off this selection of World Honey Bee treats, not one, but two artists have sent us their stunning pieces to share with you. 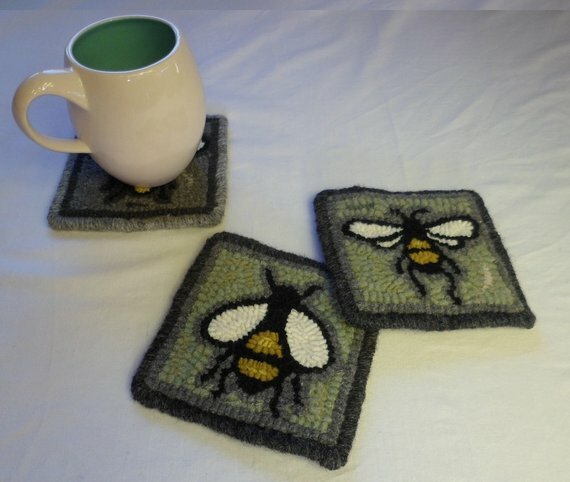 Laura Inksetter, has included her gorgeous honey bee artwork print to share with one of you lucky people and fibre artist, Jessica Steponaitis has added her lovely handmade bee design wool coasters. If you like these, take a look at their incredible Etsy pages. Seeing as we’re celebrating the honey gifts that our honey bees give us, we want to hear what the best gift you’ve ever given or received is. To enter, first make sure to like both our Facebook page and Abeego's then simply head to our page, and comment on our contest post with a short explanation of your favourite gift - it could be one that you gave to a loved one, or one you’ve received. If you’ve got any photos of the gift, why not share those with us too - we’d love to see them! The contest will close at 23:59 (PST) on Thursday August 23rd. The winner will be contacted via Facebook. This contest is only open to Canadian residents, but if you live outside of Canada, and want to tell us your greatest gift stories, please do! We hope you have a wonderful World Honey Bee Day on August 18. Let us know what you’ve got planned. We’ll be paying a visit to our hives and seeing what delicious honey gifts they have ready for us to harvest.